REO UK has released a whitepaper proposing that a lack of efficiency in industrial power drive systems means there is currently 44TWh/a of energy savings that could be made across the sector. REO has demonstrated the results in its own laboratory tests outlined in the paper and suggests that better harmonic mitigation and a change in the rules is required. The focus on climate change and the targets set by many countries to achieve a 20 per cent reduction in carbon emissions by 2020 has prompted many industrial businesses to re-evaluate their equipment and processes. This focus is now turning to variable speed drives (VSDs) in an effort to meet BS EN 50598 standards: Ecodesign for power drive systems, motor starters, power electronics & their driven applications. The whitepaper explains how power quality issues resulting from the use of VSDs without a harmonic filter can result in electromagnetic interference and inefficiencies that lead to higher energy bills. The paper calls on businesses to prevent themselves from falling foul of the EN 50598 standards and failing to meet efficiency targets. "Through collaboration with VSD manufacturers, REO has identified and documented a significant energy saving opportunity, which could result in an energy reduction of 44.56TWh per annum," explained Steve Hughes, managing director of REO UK. "We know from previous legislation that a small percentage of motors contribute to an overwhelming portion of the electricity consumed by motor systems. 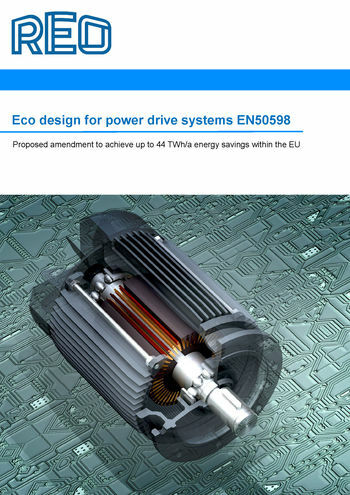 "Standards such as EN 50598 and IEC 61800 set limits on the energy efficiency of motors, power drive systems (PDS) and on the complete drive module (CDM), which includes motors combined with a VSD. "For manufacturers using equipment that does not meet these regulations, they either need to upgrade their systems or use harmonic filters to bring existing equipment into line. In the lab tests that REO has conducted in this paper, we've found that the use of a REOWAVE Passive harmonic filter reduces the paid-for energy consumption of the PDS by between 19.1 and 24.5 per cent." The whitepaper can be downloaded here and anyone looking for advice on how to improve the efficiency of their manufacturing setup can contact a representative on +44 (0) 158 673 411.